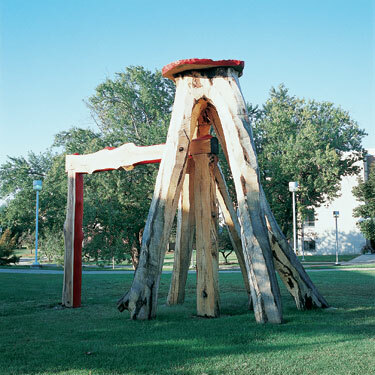 Mari Shields' installations and sculptures are site-specific, made for-and often at- their location. The format, concept and atmosphere is monumental, seductive and associative. They build on and complement qualities and relationships in the architectural or natural space. The materials are found near or around the installation site, or may have long slumbered, awaiting the ideal setting. Her projects consistently depend on a liberating reincarnation of otherwise doomed, discarded, or undervalued materials. The piece she made for the Western Michigan University Sculpture Tour, Gondwana Tahnay Landing, is made from materials found in Southwest Michigan. Gondwana is a remote and extremely ancient forest in New Zealand, sacred to the Maoris, where a whole universe of unique creatures-most in the process of going extinct-survive from dinosaur times. Tahnay is Maori for sacred place, refuge. Landing refers to the large stone perched on the top.